At SO CAL TRIKE CENTER, our trike conversion prices always include paint, (one color), installation, wheels, tires and any shipping/crating charges to give you a more realistic cost. We do not just list the lowest possible price to get your business. For example, others often list the Lehman Renegade at $8,950.00, when in reality you gotta add installation, paint, and shipping/crating, to that price before you can have a trike, not to mention sales tax, and that's for just a basic bare-bones kit, with no options! Since we started doing trikes in 1994, we have NEVER sold a basic kit; there are just too many options to consider. It takes time to know and understand all the options that are available, and why you may or may not want them, this is also why an appointment is so important. We prefer the personal approach; my name is Rix, let's start with a phone call so we can discuss what you are looking for, and what you want, then I can give you an idea of the costs involved, next we set up an appointment and a TEST RIDE at the shop in San Marcos, California. If you are looking to convert you current bike, North San Diego County has some fantastic back roads and scenery. SO CAL TRIKE CENTER could be a stop along the way to another great ride. If you are serious about a Trike or just curious and have questions, maybe you have never ridden a Trike, give SO CAL TRIKE CENTER a call today for your TEST RIDE appointment! We here at SO CAL TRIKE CENTER look forward to meeting you and developing a long-lasting relationship based on our trusted service and support to keep you safe and in the wind! to test ride proven trikes available for sale. Hitting the road on three wheels is a riding experience like none other, so trust all your trike needs to a shop like none other - the SO CAL TRIKE CENTER. As the first and oldest trike shop in California, SO CAL is the only shop in the state that's certified and authorized to build, sell and service the top trike brands in the industry. At SO CAL TRIKE CENTER, we live, eat and breathe three-wheels! Running the number one trike shop in the state does not happen by accident. Wholly dedicated to the trike community and riding, we ride everyday. And when we're not riding, we're busy crafting, selling and servicing trikes for you and our fellow riders. 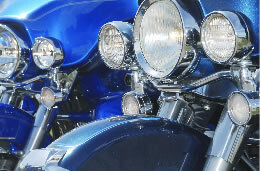 For new trikes, road-proven trikes and/or custom builds look no further. Whether you seek a trike to aid with a disability, a custom trike built for pure style and/or performance, or just a simple excuse to go knuckle to knuckle with the wind on Three Wheels, SO CAL TRIKE CENTER is your First choice. And when it comes to wrenching, the service at SO CAL TRIKE CENTER is unmatched; MMI and Harley-Davidson PHD factory training as well as Lehman Trikes factory trained to maintain, service and install your Lehman Trike, or California Side Car Trike, or Champion Trike, or any trike you choose. Our mechanical expertise is hard earned! From metrics to American steel, SO CAL TRIKE CENTER is the shop Southern California trikers have been turning to since 1994. If you're thinking about a switch to three wheels, make an appointment to come on in to see what it's all about. We guarantee that once you see, hear and feel the ride of a trike, conversion is inevitable. And if you already ride, you're already one of us, so cruise on in to shoot the breeze and talk some shop with your best friends on three wheels - SO CAL TRIKE CENTER. And, we have you covered for the dismount, too. Our modified Thule Rack Systems let you fold and mount your wheelchair to your trike or trailer, which means it's always within reach for the off-the-bike action! This electronic actuator system shifts gears with the simple push of a button. Best described as an “electronic foot,” the Kliktronic system makes shifting easy, faster and more accurate. With all the operational controls mounted to your handlebars, you hit the road without any assistance—which is what riding is all about. SOCAL TRIKE CENTER modifies 2 popular Thule® Racks specifically to safely mount & haul your wheelchair. Shown here is the New K-LEVER2 system for Handicap Riders, it can be configured several different ways. For the Right or Left Side. It can be a Double Brake or combination Clutch and Brake, Cable and/or Hydraulic too. A DISABILITY DOESN'T HAVE TO MEAN THE END OF YOUR RIDE! So Cal Trike Center offers a complete kit for you. This exciting new innovation, K-LEVER 2 from the manufacturers of the Kliktronic Electric Shifter is the perfect solution for motorcycle riders who are unable to use their right foot for the rear brake. The modular design allows independent operation of both front and rear brakes using just one hand. It can be configured for clutch and brake operation, hydraulic and/or cable, even Right and/or Left side for total versatility. Available in natural or black finish. Fluid Reservoirs, Hoses, Fittings, & Residual Valve, (if needed), must be purchased separately. So Cal Trike Center offers a kit for your Trike, Bike, or Sidecar Rig!